Separators can be used to collect water returning from the reverse slope steam pipe. There is a range of sizes to accommodate different duct pressures. They can also be used to change direction in the steam line from horizontal to vertical, and will act as a collection point for any condensate that does occur. A drain connection allows the water to be taken to a suitable drainage point, usually the main tundish by the steam generator or straight into a drainage ring around the plant room or building. All atmospheric steam systems need this type of device to ensure the steam flows correctly. 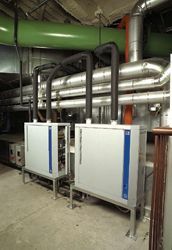 Pressurised steam systems have similar devices but they are used to separate out the moisture held within the steam so that dry steam is delivered to the point of distribution. Electrode boilers have two types of cylinder available: disposable and splitable. The electrode layout is identical, it is only the construction that changes. The cylinder material would be re-cycleable and solar degradable. It's not a viable proposition to recycle the plastic cylinders, as the calcium deposit would be difficult to separate out. They tend to be disposed of in landfill sites. (They don't make very good plant pots either as the sun breaks down the material and you will end up with a pile of earth on the patio). The disposables have the two halves welded together and the splitable type have the halves clamped, screwed or clipped together. The type of cylinder depends on the user's preference. Maintenance sub-contractors tend to favour the disposable as it can be changed very quickly, where as on-site operator staff lean towards the splitable to allow cleaning to take place. Resistance heater cylinders are cleanable devices, made from either stainless steel or a heat resistance plastic with stainless steel elements. The calcium deposits will still be prevalent. The only way to reduce the sediment deposit is to address the feed water quality. Gas-fired humidifiers are of a similar nature to the resistance heater except we use gas rather than electricity to heat and boil the water. The gas to water heat exchanger needs to deal with the gas flame and its passage through the heat box and the fumes of combustion. Again the sediment deposited in the water chamber will reflect the feed water quality. In both resistance and gas-fired boilers we should consider a minimum water treatment of base exchange or water softening. This particular design uses tightly packed tubes to the front and finned tubes to the back to enhance the surface area and increase the heat transfer efficiency. The laminar mat burner ensures an even spread of flame across the full cross sectional area of the firebox. All the internal water feed and drain components are the same, as you would find in the equivalent resistance heater system. We are pushing the definitions to call this a cylinder but it carries out the same function as the equivalent electric atmospheric devices. Before we talk about the water connect itself we should look at the feed water quality and the minimum requirements for water treatment. In broad terms we know the water in the north of England would be predominantly soft and relatively pure whereas in the south of England the water would be hard and very conductive. Each location and even the site will differ slightly. For example in London there are some buildings that are fed from their own borehole rather than the mains. This can make life interesting. As a rule of thumb an electrode boiler should be fed with raw mains water rather than softened or treated water. There have been incidents of silica appearing in mains water. This is an extremely good electrical and thermal insulator and is attracted to any hot surface. The elements of the electrode and resistance boiler would be well insulated and even the gas fired water box would be coated on the inside, preventing the passage of heat or electricity. The answer to this problem would be to fit a silica filter in the mains feed. There have been instances of chlorine being present in small quantities in the supply water. 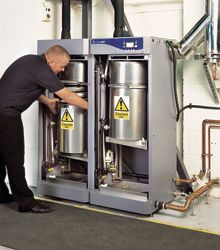 As the water is boiled the concentration of chlorine builds until it starts to attack the stainless steel elements or cylinder/heat exchanger wall. Tests have shown that normal drain intervals would take care of the build up of concentration assuming the initial chlorine level is below 170ppm. The cure for excessive chlorine in the mains water supply would be a de-mineralisation plant or to find a water supply that does not have this contaminant. There will always be an exception to this rule and a good way of identifying the quality of the water supply is to ask the local water supply company for an analysis of the supply to the specific site. 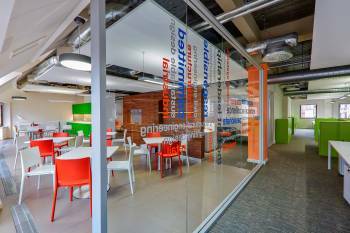 This is free but must be requested by the building owner/occupier. If the water were taken from a borehole then a water analysis would have to be conducted on a physical sample. If you were unsure it would be wise to contact a water treatment company or ask the advice of the Water Management Association. In broad terms you can supply raw water to a resistance and gas-fired boiler. It will coat up with calcium over a short period of time and need cleaning, thereby increasing the maintenance cost. A better solution would be to supply softened water as a minimum treatment. This has the effect of changing the sediment to a powder rather than a calcium scale. The drain pump can then easily take it away during the drain cycle. This drain time, and therefore a feed or top up time would mean a reduction in steam output. Not a good thing if it is a close control application. Increasing the feed water treatment to include a carbon filter and a reverse osmosis plant would reduce the contaminant levels to an extent where very little drain time would be required to clear the total dissolved solids. There simply would be very little contamination to collect. It is good practice to have mains water-isolating valve and a fine screen strainer on the inlet to each humidifier. There is a 25mm air gap built into the tundish housed within the unit itself that conforms to local and national water board regulations. The tundish is positioned at a level higher than the top of the cylinder to ensure it will fill. The humidifier will drain on a regular basis as part of its attempts to reduce the concentration of contaminants. This water will be at 100ºC because it would have just come off the boil. Care should be taken with the material used external to the humidifier to take this water away. Normal wastewater pipe work, whether plastic or copper is capable of taking this water. The external tundish should be positioned to one side of the cabinet to prevent any steam from accumulating underneath and potentially accessing the mechanical and electrical sections. The gas-fired humidifier has an external drain tundish mounted to the front. Care should be taken with the material of the next stage of drainage. Sometimes the most convenient point of drainage is the rainwater gully. The plastic material used now is not suitable for boiling water in which case the water must be taken to a holding tank long enough for the temperature to drop to 40ºC, or mixed with cold water to bring the temperature down. The older cast iron down pipes are not susceptible to this hot water. Ideally the drain water should be run to a domestic hot water drain in a material designed for high temperatures. Electrode and resistance humidifiers require a power supply designed and run in accordance with local and national IEE regulations. Cables should be sized to suit the site conditions but an isolator should be mounted close to the humidifier. This isolator may be a single throw or in the case of a twin cylinder unit may have to be a double throw, as two supplies must enter the humidifier. Suitable protection should be included; this could be fuses or MCBs at the distribution board or a switched fused isolator at the humidifier location. All external switches must be sized and selected by qualified and competent electrical engineers. Gas-fired humidifiers should be connected to an adequately sized supply by CORGI registered personnel. Following the guidelines for proving, connection and testing the supply to ensure full compliance. The gas humidifier would be pre-set for the type of gas for that country, region or site and be fully approved in accordance with European gas regulations. All humidifiers on sale in Europe conform to EMC directives as indicated by the CE mark displayed, normally on the serial number plate. However further consideration must be borne in mind with regard to the external wiring. Use a dedicated, earthed metal conduit for both the control signal cable and the security circuit cables along their entire length. They may share the same conduit where practicable. The earth must be made by 'metal to metal' contact and should be a good radio frequency earth. The control and security circuit connections should be run in screened cable with the screen grounded at one end only. The screen should be maintained as close as possible to the cable ends and any tail between the screen and earth must be kept short. An alternative would be to use the in-built controller that needs an output signal from a space or duct mounted transmitter or sensor. These sensors are powered from the internal control board and relatively easy to install and operate. Which ever is used the sensor should be positioned in the return air path for optimum control. The installation may require a room-mounted sensor positioned close to the return air grill rather than a duct mount. As well as the control sensor it is a good idea to have a high limit hygrostat in the supply air, down stream of the humidifier as a safety device. This will shut down the humidifier if the RH exceeds 85%. This high limit value can be altered depending on the system and the projected dew point within the airflow. It tends to be a simple on/off device with the ability to have the set point altered to suit the system psychrometrics. This hygrostat forms part of the security circuit and would be wired in series with an airflow switch or a fan interlock. Both these would shut down the humidifier if the air supply failed. There also may be a need for a chiller or cooling interlock. The majority of systems would only need humidification in the winter, which by definition would not require any cooling. If cooling is required the psychrometric dynamics may not require any moisture addition. In which case if the chiller is on the humidifier is off. This can be achieved by this serial connection to the security circuit. Some close control application may require humidification whilst cooling, basically offsetting the latent cooling experienced with the coil. 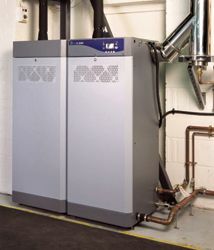 Larger systems may require a number of humidifiers all serving the same air system. The humidifiers can be connected in such a way as to have a single master that is fully proportional operating between 8% -100%. On reaching its maximum output and the system calling for more moisture the master would switch on slave devices of similar size but these would be on/off humidifiers. The master would then ramp down to its minimum output and start the process of increasing its capacity until the air system is satisfied. There can be between 7 to 10 slaves in a system dependent on the control architecture and normally looped together in series. Each slave has a dedicated address that depicts the order in which it is turned on. Each master / slave humidifier should have their own steam pipes rather than putting them into one. During peak power periods the amount of energy consumed may be limited and the ability to turn off a single or a number of humidifiers would be advantagous. The BMS system would have that ability and send signals to various components to turn off for a set period. Most humidifiers will have fault indication to the cabinet front in the form of flashing lights or messages on an alphanumeric display. An alarm relay is available to send a signal to the BMS that the humidifier is in trouble. This is normally all that is required. An automatic switch off situation will occur when there is a drain or feed fault. Drain fault means the pump is not working, it is either blocked or power has been interrupted. Feed fault means water is not filling the cylinder. Each manufacturer has its own way of interrogation to find out the cause of the alarm and how to rectify it. All should isolate when these drain and feed faults occur. As mentioned above these atmospheric devices would be applied in similar manner to the electrode boiler. The differences would be the quality measures involved with the mains water feed. The purer the water the less the dilution drains and the smaller the sediment collection. The power supply, in the case of the gas-fired unit would differ and the proportional down-turn would depend on the sophistication of the burner and fan. Typically one should be able to achieve 17%-20% capacity before the system shuts down. Between 17-100% would be either in steps or a smooth proportional ramp by using inverter technology to drive the fan.